Another Dramatic Victory on South African Soil ~ The Bucky Channel - The World of Sports from Wisconsin's Perspective. 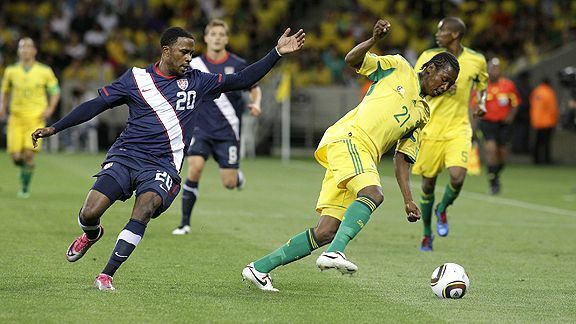 Something about playing on South African soil really brings out the flair for the dramatic for the United States' Mens National Team. From knocking off #1 Spain in the Confederations Cup in '09, to the comeback win against Algeria and the comeback tie against Slovenia in the 2010 World Cup, the Americans seem to live off of the atmosphere that the South Africans fans provide (how good was it to hear those vuvuzelas again on Wednesday?). Although it was just a friendly, they added to their resume of success in the country with a 1-0 victory over the host nation themselves. The U.S. would have been hopeful for a draw against Banafa Banafa because of the wealth of inexperience that they brought overseas with them, as this team had just five players from the 2010 World Cup squad on the roster. But the young guys stepped up, defending well making keeper Brad Guzan's day as easy as possible, and then following the veterans footsteps with a dramatic goal in the 85th minute. The hero in this one was a 17-year old kid named Juan Agudelo, a product of the New York Red Bulls youth academy which at least for one day proves that the MLS isn't a waste of time. It's important not to anoint this guy as the savior of U.S. soccer right away (we've seen how that worked out for Jozy Altidore and Freddy Adu), but Agudelo definitely deserves his due for becoming the youngest American to score a goal at the premier national level. Great win for the Americans, and their next national league contest will be Saturday, January 22nd against Chile in Carson, California.